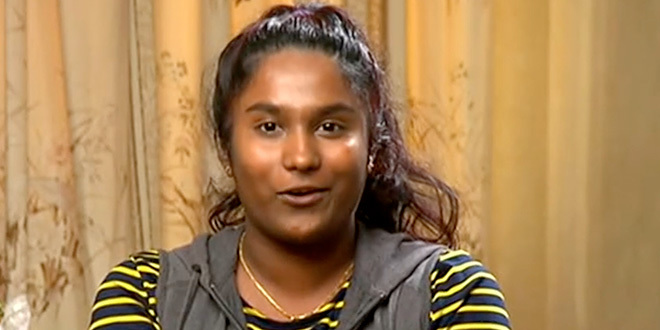 OUTSTANDING refugee student Soumi Gopalakrishnan faces deportation together with her Tamil family but, for now, she is celebrating the prospect of fulfilling her dream of studying to become a doctor. The 19-year-old was school captain and dux at Brisbane’s inner-city St James College this year, but her refugee status means she is not eligible for a domestic government-supported HECS position at university. The Gopalakrishnan family fled Sri Lanka four years ago and are now facing deportation after the Government rejected its application for a Safe Haven visa. An appeal is before the courts. Last week mainstream media picked up Soumi’s story. She explained her struggle against the odds – how the upfront course fees and increased cost for international students ruled out any hope of university without a scholarship. Since then she has received offers from a number of universities. “It just feels crazy. Now I can think about going to uni and also think about being a doctor,” she told Channel Ten’s The Project. Soumi said individuals had also reached out to her with offers of financial assistance to further her studies. Full fees for studying medicine could top $70,000 a year. “I wasn’t expecting any positive feedback, but I have received tonnes of positive feedback from the community,” Soumi said. St James College principal Gerry Crooks told SBS News that Soumi should be commended for her achievements, which included finishing Year 12 as dux. “Australia would be crazy to lose a person of her ability and calibre but also just her genuineness; these are the people we really need to look after, I think,” he said. Soumi can trace her dream of becoming a doctor back to her own experience of having heart surgery when she was five. “From that moment I realised doctors have the potential to save someone’s life and there are people in the countryside who just can’t afford health services and can’t live to their potential,” she told The Project. Soumi also explained how students at St James College – many who come from a refugee or asylum-seeker background – had been “like a family for me”. She is moving to Melbourne to be with her family who, together, continue to struggle to study, find work and stay in Australia.